Whether you’re a water sports enthusiast or you simply want to kick back and relax with a stunning view, a stay at The Bird House will offer everything you’re searching for and so much more! Located within the gated sound side community of Colington Harbour, this beautifully decorated 3-bedroom vacation rental home in Kill Devil Hills promises to provide exactly what you need to make your upcoming Outer Banks vacation the best one yet. Thanks to its amazing waterfront location along one of the many canals that wind their way through this coveted community, The Bird House is the perfect vacation rental home for outdoor enthusiasts. Enjoy easy and direct access to the calm waters of the canal that lies along the edge of the property. Here you can hop on your kayak or standup paddleboard and head out for a soothing excursion along the canal—or make the journey to the place where the canal flows out into the Roanoke Sound for a more adventurous excursion on the water. Don’t have your own paddleboard or kayak? No problem! When you rent a home in the Seaside Vacations collection, you’ll also receive access to a variety of exclusive discounts on equipment rentals from our local Club Seaside partners! 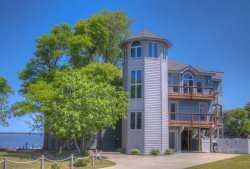 If having direct access to the water right in your backyard isn’t quite enough to keep everyone in your family entertained during your next Outer Banks vacation, you’ll be pleased to discover that The Bird House also comes with an assortment of community amenities in Colington Harbour. Head less than one mile down the road from The Bird House and you’ll find a huge lifeguarded community swimming pool that’s situated right along edge of the Roanoke Sound. Additional Colington Harbour community amenities available to guests include tennis and basketball courts, a picnic area and park perfect for playing with the little ones in your group, and a boat ramp where you can launch your own vessel for a fun-filled day on the water. And if you’re looking for the best spot to catch the most sensational sunset you’ve ever seen, venture over to the sandy beach along the northern edge of the inlet to Colington Harbour to watch the sun sink into the waters of the Roanoke Sound as the waves lap against the shoreline. Just don’t forget to bring your camera! With picturesque waterfront views of the canal that stretches across your own backyard, plus access to an array of community amenities just down the street, there’s no better choice for your next Outer Banks vacation than a stay at The Bird House. What are you waiting for? Book your vacation today and let the countdown to fun in the sun begin! Main-Level: Living area with deck access, kitchen with breakfast bar, a master bedroom with queen bed, a bedroom with a double bed, and a bedroom with a queen bed (these two bedrooms share a hall bathroom).